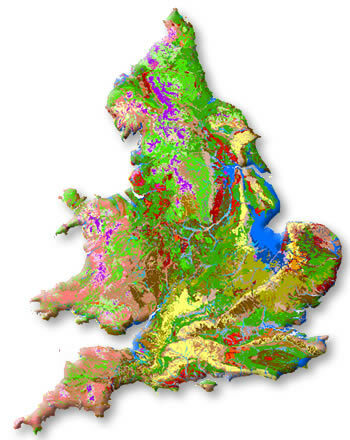 Soilscapes is a 1:250,000 scale, simplified soils dataset covering England and Wales. It was created from the more detailed National Soil Map (NATMAPvector) with the purpose of effectively communicating a general understanding of the variations which occur between soil types, and how soils affect the environment. Soil heavily influences our whole ecosystem and is a fragile resource that needs to be understood and protected. What if I want more detailed soil information? Soilscapes is a freely available resource that offers soil overview information at a relatively basic level. If you require more detailed soil information, the Cranfield Soil and AgriFood Institute (CSAI), incorporating the National Soil Resources Institute (NSRI), is able to offer a range of other services from detailed downloadable soil reports to professional consultancy services. We also offer a range of soil publications and digital soil data sets. Soil Site Reporter - The Soils Site Reporter is an easy-to-use, online soil reporting tool which produces site-specific soils information with maps and soil descriptions. Each report, downloadable in pdf format, provides detailed information on the expected soil conditions at the site and outlines interpretations of the suitability for different uses. Online soils guide - Use the LandIS online interactive Soils Guide toolkit to explore the various soils of England and Wales. You can use the tool to 'drill down' into the various recognised soils categories to understand their composition and properties. Consultancy and other information services - CSAI has long-standing experience in the design and implementation of information system applications across a variety of sectors. CSAI can provide consultancy services ranging from initial planning and analysis through to the development, deployment and subsequent support of computer-based projects for environmental analysis. Data products - As part of an ongoing programme of data enhancement LandIS holds a wide range of environmental and soil-related data, including basic soil-survey data, laboratory analyses and numerous derived and thematic datasets. The latter datasets include soil physical and chemical parameters and pedo-transfer functions, agroclimatic information, land suitability factors and environmental risk ratings which can be provided in all common formats. Soils education - Soil-Net.com is a free and compelling environmental Internet resource for Key Stages 1-4 providing teachers and students extensive curriculum-based information about soil. As one of the three major natural resources, alongside air and water, soil is vital to the existence of life on earth. Soil-Net.com will help you discover what soil is, the teeming life in soil and about the many environmental threats facing soils. Remember, soil is all around us, just under our feet!. Please contact us to find out more about our services or to talk to a member of the LandIS team.